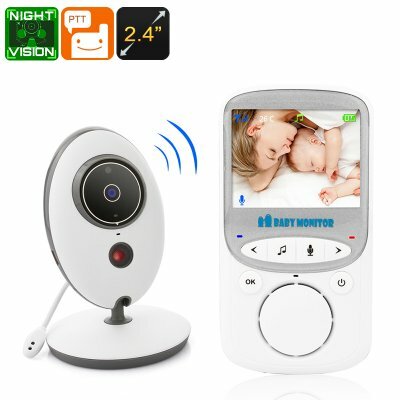 Successfully Added Video Baby Monitor - Two Way Audio, 2.4 Inch Display, Room Temperature Monitor, Night Vision, 70 Degree Lens to your Shopping Cart. Keep constant track of your beloved baby with this video baby monitor. Featuring a 0.3MP camera, this baby monitor allows you to clearly observe everything that’s happening in your kid’s bedroom while he or she is taking her mid-day nap. Supporting 5-meter night vision, this baby video monitor furthermore provides you with high-resolution video after dark. Thanks to this, the baby monitor guarantees that no matter the time of the day, you’ll always be able to make sure your beloved baby is safely enjoying his napping time. Simply place the baby video monitor in your child’s bedroom, sync it with the LCD display receiver and you’ll be all set to keep an eye on what’s going on upstairs. Featuring a 2.4-inch high-contrast screen, the receiver will spoil you with high-end and ultra-clear footage. A built-in microphone and speaker furthermore allow you to hear when your baby is waking up and – in case necessary – lets you talk back to your baby from afar. With a 260m operating range, this baby video monitor can be used efficiently in every household. Besides allowing you to keep an eye on your sleeping beauty – this video baby monitor furthermore is capable of displaying the room temperature. Thanks to this feature, you can always check on the environment of your baby’s bedroom and adjust the temperature whenever deemed necessary. To increase the napping comfort of your little boy or girl even further, this baby video monitor is capable of playing bed time songs at the touch of a button. From now on you can be guaranteed that your baby will sleep within no time while dreaming away to his favorite childhood tunes. Packing a 750mAh battery, you’ll be able to use the monitor for up to 4 hours without the need of an external power supply. This video baby monitor comes with a 12 months warranty, brought to you by the leader in electronic devices as well as wholesale electronic gadgets..